The following is excerpted from LDS Daily. To read the full letter, click here. In April 2016, Jessie Carter was called to serve a Spanish speaking mission in the Arizona Scottsdale Mission. For Carter, it was a joyful experience after a long journey. For four years, she had been working to overcome obstacles that would allow her to serve. She didn’t tell her family when she sent in her final application and surprised them with the mission call. 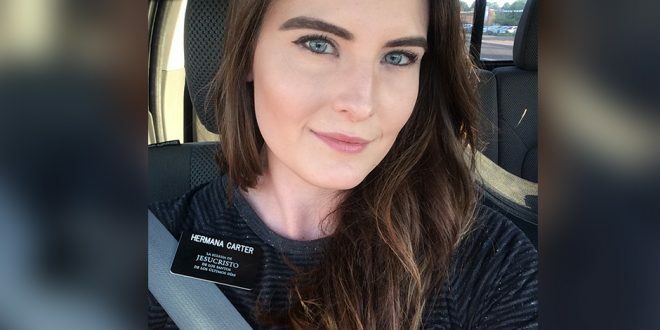 In August 2017, after 12 months of faithful service, Carter was released honorably from her mission and came home early due to health struggles. The letter she sent to her family and friends announcing her return is a powerful witness of Christ and an important piece on mental health and missionary service. Read the letter below. I would say that I am going “home,” but home has turned into a different idea for me. Home is where you are most happy and, honestly, I am most happy testifying of my Savior, Jesus Christ. So I guess you could say that my home is right here inside of me, where my heart is. There is no other experience that I have had on earth that equals the happiness I have felt in drawing near to Him and sharing Him with others around me, my brothers and sisters. And, as much as I like being called special or thinking I am unique, this is not an experience that pertains to only myself. You can all feel that way. Draw near unto Him, come unto Christ, and drink from the living water! This is a happiness that will quench your thirst for the rest of your lives. You will never spiritually hunger again. But, you must do it of your own free will and choice. I cannot convince you. I can only testify, and testify I will! Now, I shall be Frank. But you may still call me Hermana Carter. The real reason that I am being called home pertains to the health struggles I have been battling. Since I was a sophomore in high school, I have struggled with depression. Some experiences that I have acquired since have augmented that personal challenge and tacked onto it anxiety, Post Traumatic Stress Disorder, and a few other layers related to that group of fun things. I have come to accept that I may have to coexist with this for the rest of my life. Depression is very real. It baffles me that some people today, despite the revelations of modern medicine, still make the argument that it is not real, to whom I would say that they are merely in denial or do not believe in things they cannot see. It is just as those who refuse to believe in Christ because he is not physically manifesting himself in front of them. To read the full letter on LDS Daily, click here. I'm older 66yrs old and I have suffered through 3 or 4 bouts of major depression which comes with anxiety disorder. panic attacks and the like. you never know when it will hit. good people have this problem and usually its genetic and comes from someone in the family. my mother was the one who had it and got through hit her way. by the time I got it I was aware of getting one on one therapy and that is what I used and didn't use medicine. it wasn't until I had a hysterectomy that I was put on an antidepressant. I didn't want to take that and its why I didn't for the two times I had episodes. however, when I took it I was able to sleep at night and eat because the hysterectomy left me wanting of both. the medicine helped me so much and got rid of something I never knew I had which was social anxiety. I then went to college at 38yrs old and was able to function better without all the fear. life throws curves sometimes and we each have to deal with it in our own way which is best for us. the best thing to do is to forgive ourselves for short comings because of health issues. God knows all things and He is aware of what you need. I had to quit going to college and suffer through another bout even though I was on medication. I found my solace in Christ. strength comes from relying on God and the Savior as I have learned over all these years. I have had other health trials that I was able to get through because I had gone through the trial of having major depression and anxiety disorder and it also helped me to empathize with others in any illness. Thank you for sharing your amazing insight. I have no doubt your article will be a help both to those who suffer from depression and those who love them and want to better understand. The Lord, through His leaders, has given you an honorable release. Anyone else's judgment is a reflection on them, not on you.